What came first, the chicken or the egg? For us: the chickens. Today is our first full day with three chickens and a chicken tractor!! My mom sent me a link to a chicken tractor for sale in Gilmanton, NH that would include three already laying Rhode Island Reds with the purchase (and after asking - some feed, straw and wood shavings). My Dad and I picked it up last night in his truck while Joel fenced in the garden. These are pictures from the people who made the tractor. I really love this and can't wait to see what comes of this long term! Our first egg on the right. Seeing the chickens come out the door! The first chicken he saw! I'm thinking that someday, we might make a second tractor with a little different design, and then get some more chickens that we raised as chicks. I already know that we'll probably raise this tractor a few feet, net in the bottom, add a ramp and some wheels, so that they can have double the grass space. We are ecstatic with what we already have, but can see how we can use this all as a springboard to grow in how we raise chickens and eventually expand! Water is free, so it doesn't really mater, but they drink a lot of water! I don't know how much these ladies will drink because I still have to see, but I've read (after wondering why the water was already empty) that our three could go through a gallon a day or more. They don't smell bad themselves, but their poop smells really bad! Duh! But it still surprised me the first time I smelled it. And if you get it on your clothes at all (like on my rain coat) you'll be frantically trying to figure out why you smell so bad. Multiple chickens use the same nesting box. I just never knew that. They can be friendly if you handle them from the beginning. None of these things are deal breakers, but it was funny to encounter each one of these and realize how surprised I was! Earlier this year, I wanted to get chickens, but after all the reading and asking about how to make a coop or chicken tractor, the food, raising the chicks, the heat lamp, where to get everything... we fell out of the planning stage and pretty much resigned to not having chickens so that we could focus on the other things (garden, home renovations, baby!). The time we would put into planning, making the tractor, and raising the chicks wasn't possible this year. We wanted our own fresh eggs - duh! We didn't have a lot of money to spread between the equipment, materials, chicks, etc. I think what this family did was pretty cool and was probably the only way that we would have started having chickens this year. If families who have chickens are handy and have the gumption to do it, it seems like this whole idea would be a great family project every once in a while and a great way to help another family get started on something that is totally foreign to them. 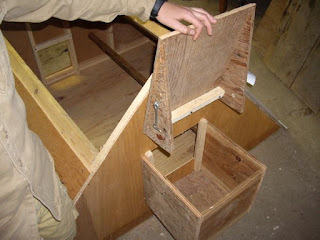 With this "Chickens for Beginners" idea, an experienced person/family (even better if it can be a family or father-son project like the one we got) provides everything a newbie would need to know, and everything they need to get started so that they can either follow right in the foot steps of their chicken mentor, or get started and adapt their own style as time goes on. It could be nice if the chickens come from a family that didn't need to get rid of the chickens so that they can offer to take them back if there are problems (I never thought of this before, but noticed this offer on another chicken sale that was unrelated to the chickens we just got - basically the family cared if the chickens were well cared for and wanted to offer a way out if the new owner had problems). Settle on one price for it all and know you are paying for the time this person is putting into the project and the time they are saving you because they are doing everything based on experience. Family friends could do this for each other and it would be easier. Families use to pass knowledge down from generation to generation about raising livestock and the generations had experience seeing it in action, most people don't have that opportunity and most people have to learn from the many opinions online or from friends. There are so many ways to go about it that it is hard to wade through it all and come up with one plan. Having one person who made your first tractor or coop, gave you a few chickens to start with, and who is willing to help you when you have questions is awesome! I still think the newbie should learn as much as they can so that they know basic care and some basic preferences like stationary or portable housing, organic feed or not, free on the property or in a fenced in area, protection against predators, specific bread or any etc. If they can do everything themselves, that would be even better and could be its own family project and learning opportunity. 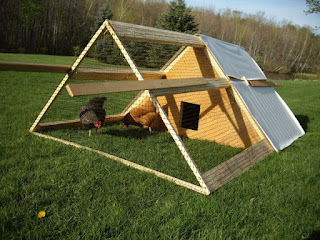 The garden was our big learning opportunity this year, and we needed the jump start we got from this cool chicken tractor and chicken sale idea.